📢 Attention Salesforce Certified Trailblazers! Maintain your credentials and link your Trailhead and Webassessor accounts by April 19th. Learn more. Describe how Salesforce approaches customer success. Explain how the Salesforce Success Cloud can help you achieve your goals. If you are new to the Salesforce universe, welcome to the Ohana. Ohana is the Hawaiian word for family, and it’s how we think of all our customers, employees, partners, and investors that together make up our thriving ecosystem. Our culture of Ohana is about caring and working collaboratively to improve our businesses and communities, and since 1999, we've seen millions of Trailblazers just like you accomplish some amazing things together. Perhaps you noticed another word we use a lot at Salesforce: Trailblazer. As a customer-focused company, we like to celebrate people who put customer success at the center of their business. Trailblazers are people who inspire us and others by transforming the customer experience, by growing their careers, by driving change and innovation. They can be anyone. An admin, a marketer, a CEO, a student, you! 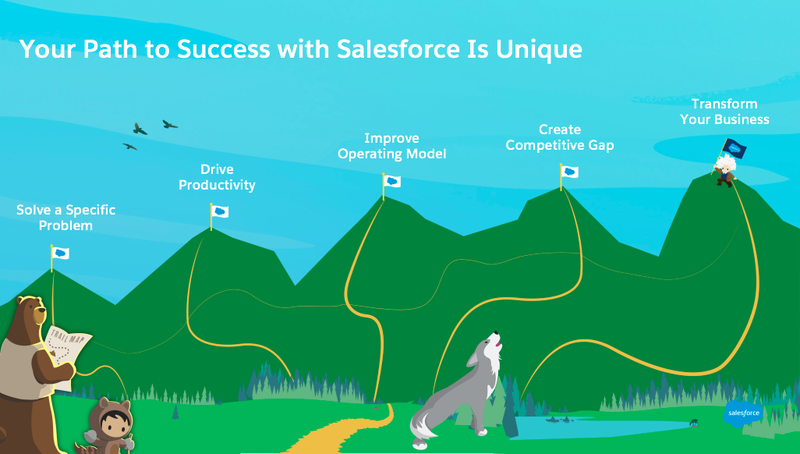 The Salesforce Success Cloud is all about showing you how to blaze your own trail with Salesforce. Salesforce is a big world to explore. Sales Cloud, Service Cloud, Marketing Cloud, Einstein Analytics, and so much more. There are so many products, so many resources, and technology’s always evolving. Whether you’re a new customer or a seasoned pro, it can sometimes feel overwhelming. So how do you navigate the vast universe that is Salesforce? Salesforce Success Cloud is here to help you with resources, services, and trusted experts all focused on one thing—showing you how to achieve your goals. Your company is unique, and your customer relationships are one of a kind. So of course your path with Salesforce is going to be unique too. Perhaps you want to get that elusive single view of your customers, or you hope to become more agile to get an edge on your competitors. No matter what your goals are, the Salesforce Success Cloud can help you reach them faster. With Salesforce Success Cloud, you get the help you need to adopt new technologies, overcome obstacles, set goals, or even change the way you do business. Our customer success methodology is about meeting you exactly where you are with guidance to help you reach your next milestone or conquer your next summit. Let’s see how Salesforce Success Cloud resources enable you to get more out of any solution or your entire implementation. There are three ways to engage with the Salesforce Success Cloud. Depending on what you’re trying to accomplish and where you are in your journey, you can even choose all three. Do it myself: I want to do it myself, and learn and explore always-on resources on my own. 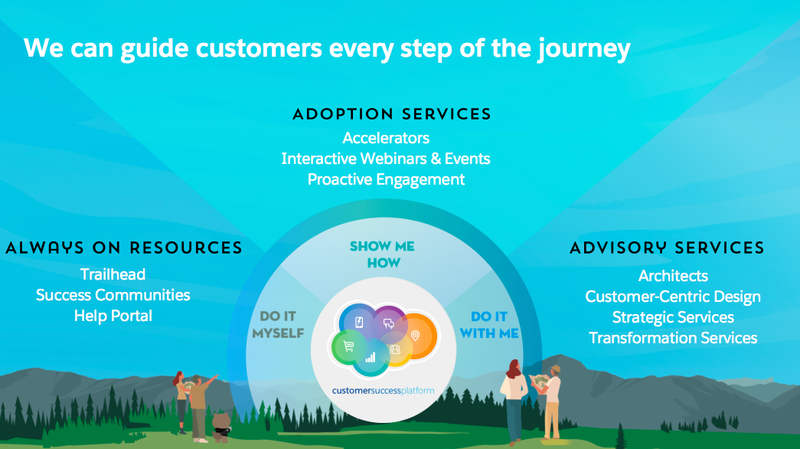 Show me how: I’d like Salesforce experts to show me how to meet my goals through Adoption services such as Accelerators and webinars. Do it with me: My goals are transformational, and I need all the help I can get! I need Advisory services to partner closely and deeply with my organization. Let’s learn a little more about each. Always-on resources are available free to every customer, out of the box, no matter what size. They’re perfect for the do-it-yourselfer in all of us. 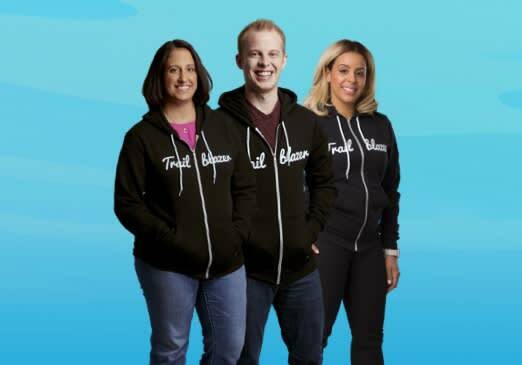 Trailblazer Community: Ask questions, share tips, and learn from Salesforce experts and customers. Salesforce Help: Find Salesforce training, help, and support, all in one place. Adoption services give you direct access to the experts when you need to get things done fast—so you can focus on what matters to you. Use Adoption services when you really need guidance from an expert. Advisory services are there when you want to transform your business through strategic and technical guidance. If you’re already working with a Salesforce partner, our advisors can fit in seamlessly to complement your partner’s strategy. All our architects and designers use our customer success methodology to achieve unique outcomes for each customer. Getting to know you and aligning on a definition of success is a crucial first step. This can seem obvious, but our approach is designed to dig into what really matters, so we can build a plan for you. Our approach is customizable, and it works for customers large and small. Together, we define the best path to success based on your current situation and business goals.